Hey everybody! Dan here. Sorry about the infrequent updates, I’ve been traveling a lot for work this past September, plus I got engaged! Yep, I’m about to be a married man! Not until next year, but still. Anyway the dust from September is finally beginning to settle, Secret Wars #6 is FINALLY out and Netflix’s Jessica Jones is right around the corner in November. Exciting times up ahead! Future updates for the site will include more VS. battles and with the onslaught of comic book movies and TV shows on the horizon (Batman V Superman, Supergirl, Captain America, etc. ), I would like to get some backstories up as well so you will be all prepared when those movies and TV shows come out. Another update I would like to get live as soon as possible is a visual menu to the “VS. BATTLES” page. Right now, it’s just a list of hyperlinks and my vision for that is to change the list format into picture thumbnails. It’s a fairly easy process to create the thumbnails, it just takes forever, especially when i’m adding new stuff. Thanks for reading and coming back to support the site. 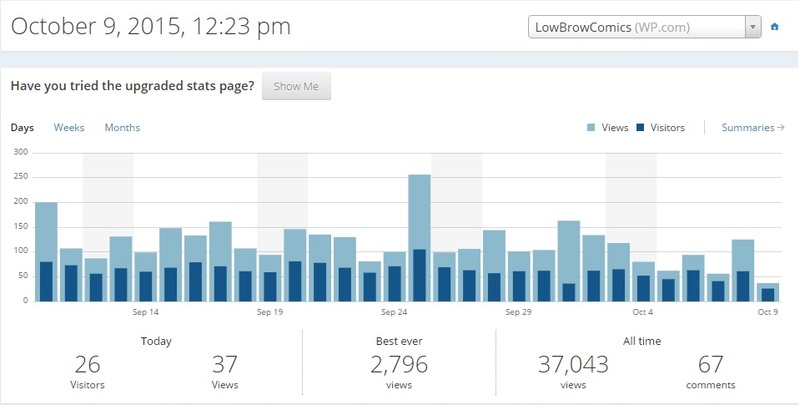 In October we hit over 37,000 total views since I launched the site in March 2015. That’s a hair over 4,600 views a month! I never thought I would get over 20 a month so this is awesome! I’m super excited to see where this site is at this time next year. Thank you all for stopping by, I love each one of your faces and hopefully we can talk soon! This entry was posted in update and tagged update on October 9, 2015 by lowbrowcomics.